Latest Harry Potter Video Game is a Third Person Shooter? Harry Potter and the Deathly Hallows Part One looks like it will be a much darker game than fans of the series are used to and will play like a third-person shooter. No more puzzle solving and exploration for Harry. This time around Electronic Arts' take on the popular wizard will be all about the magical combat. "The final Harry Potter adventure has given us the opportunity to make a darker and more action-oriented game than we have before," says Jonathan Bunney, VP, Head of Production at EA Bright Light. "We believe we are creating a Harry Potter game that the HD console gaming generation will appreciate and enjoy. We have built new technology specifically to allow us to prove that magic is a truly potent force and, in this game, players will need to use all their skills if they want to survive." Both Harry Potter and the Deathly Hallows Part 1 and Part 2 are being developed by EA Bright Light Studio for the DS, PC, PS3, Wii and Xbox 360. Part 1 is due out this autumn. 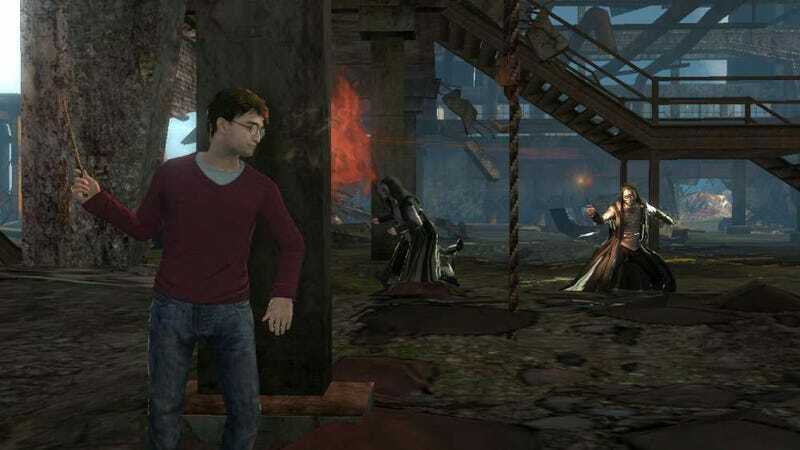 The Harry Potter and the Deathly Hallows Part 1 videogame is packed from start to finish with action and combat, according to the press release. Players will be on the run, fighting for survival on a desperate and dangerous quest to locate and destroy Voldemort's Horcruxes, engaging with Death Eaters and Snatchers in epic battle sequences at every turn. To amplify the action, players will encounter ferocious creatures from the previous films in addition to the adversaries Harry faces in the seventh film. They will need to muster their most powerful magic against relentless assaults from all sides. There are no more lessons, no more training. This time the danger is real. It's time for players to fight for their lives. Judging by those screen shots the game plays from a third-person perspective and includes some fierce wand vs. wand combat. Interesting shift for the game, but it does seem to follow along the shift the books took as well, becoming a much darker story near the end.